"Now there's Allie Fralinger's farm, the big red barn," said local artist Pat Witt. She knew the place well. She often painted from the very spot. She did not attach any other names to the farm. To her, it was the Fralinger Farm. "That was one of the highest places on the Maurice River," Witt said. For a long time, the site was known as the Lore Farm. In his 1885 book, History of Port Elizabeth, W. F. Bowen noted that the farmland "is what is now known as the ‘Lore Homestead' on Maurice River." In 1771, when Mrs. Elizabeth Clark purchased the land that would become Port Elizabeth, the farm consisted of "probably the best set of buildings in the vicinity," wrote Bowen. Early maps and documents indicate that Jonas (John) Hoffman, one of the very first settlers along the Maurice River, deeded a section of his land to Hezekiah Lore in the mid-1700's. The Lores moved onto the property about 1750, and Hezekiah set about to build his legendary barn. Many accounts of the Lore barn, including this one in the History of Port Elizabeth, include this local lore regarding the structure: "At the time tradition says he owned the only horse and the one ox between Maurice River and Cumberland Furnace. He built the barn, still standing, the frame of which was cut and hewn at Antuxet (now Newport), and floated down the bay and up the Maurice River to the farm. The barn was twenty-five by forty feet in size, and the people who assisted in raising it declared that there would never be enough hay along Maurice River to fill it." Before Lore, before Hoffman, there is evidence that this location was once a Lenape campsite. Witt and others were interested in doing an archeological excavation to confirm the theory. Allie Fralinger gave permission to do a dig there and the state worked up the necessary permits. The work was for naught, Witt recalled. "The day of the dig, the state people were there," she said. "The mosquitoes attacked them. And then a vicious storm came up." 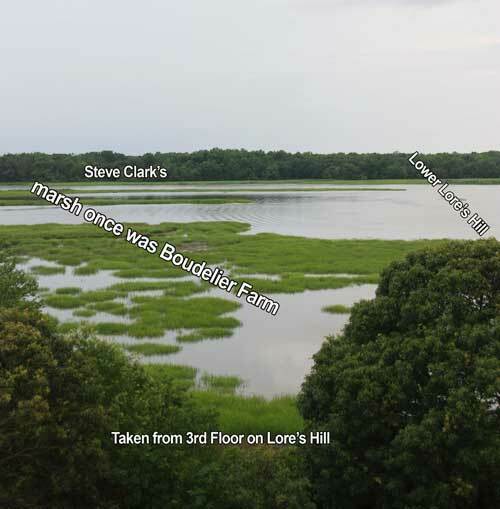 Everett Turner, Herb Vanaman and Jean Jones were also familiar with the evidence indicating that there had been a Native American campsite along the high banks of the Maurice River at the Lore Reach. "Years and years ago," Turner said, "there used to be what was called the Boudelier Farm. It was the Hezikiah Lore farm originally. Lore built a big barn. He built a big beautiful colonial house there." Turner recalled going fishing on this reach. "There was a real high bank there - one of the highest banks on the Maurice River. My brother and I used to go fishing and walk the beaches there." On one outing, Turner noticed stratification on the banks that indicated where the water level was so many centuries ago. Unfortunately, Turner said, others made the same connection and people began to dig into the banks looking for artifacts. Turner and other local members of the Archeology Society of South Jersey were horrified to see the "potholing" that took place, making any real scientific excavation very difficult. It appears that this tract of land had a very interesting history: from wilderness and native site, to ownership by the early Swedish settlers, to the prominence of the Lore descendents, and into the hands of the Boudeliers, the Fralingers and others. There are many references to the Boudelier Farm. Local resident Richard Weatherby is familiar with this part of the Maurice River. "The Fralingers didn’t own it ‘til way after the Boudeliers," he said, adding that another tradition holds that bootleg whiskey was made at that Boudelier Farm during prohibition. Julie Smalley, who spent summers on Acorn Island, said that she also knew the property as the Boudelier Farm. "A long time ago, there was a farm there," she said. "You really couldn’t see it from the river - and we were not allowed to go there. We'd heard all kinds of stories that you were not allowed to go near the Boudelier Farm." Julie said no one ever said what was going on there. She did remember seeing horses on the property at one time. 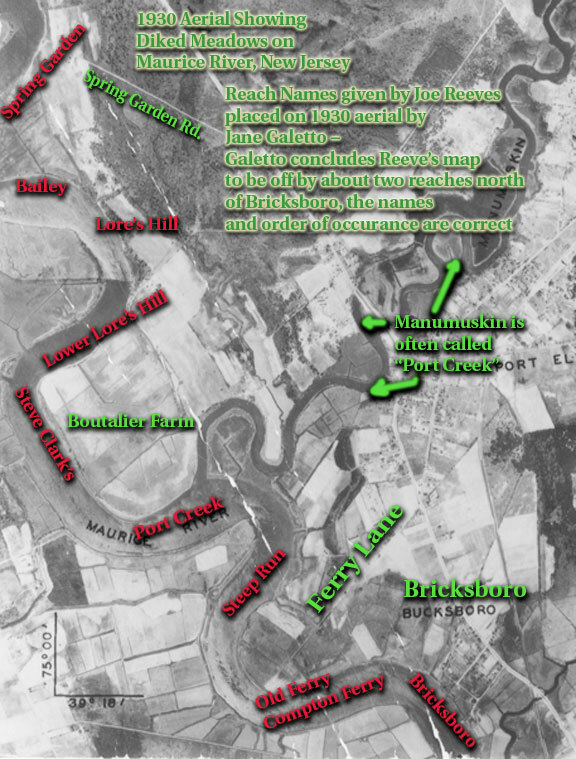 When Philip S. Nutt gave his presentation "Places not Well Known, Near Home" to the Vineland Historical Society in 1936, he referred to the location as the Boudelier Farm. He took his audience on a virtual tour to "just this side of Port Creek…to the Boudelier Farm, also known as the Lore Farm." Nutt's research revealed that the barn burned down and a second one, part brick, was built. He reported that this second barn had "burnt down a few years ago." Nutt traced the more recent ownership of the property: Mr Schaible, who built another barn on the same spot in 1935, Bobby Whitaker of Millville, and Mr. Carew of Vineland.